Drilling begins by first installing casing, steel pipe that extends from approximately one foot above the final grade, to at least ten feet into the ledge or bedrock, depending upon the site. This creates a seal that minimizes the chance that surface water will contaminate the groundwater supply. In Connecticut, most water wells require between 40' and 120' of casing. Once the casing is installed, the drilling process continues: a drill bit is sent down the casing while simultaneously water is introduced into the borehole. The water creates 'slurry,' which carries debris from the drilling up and out of the bore. 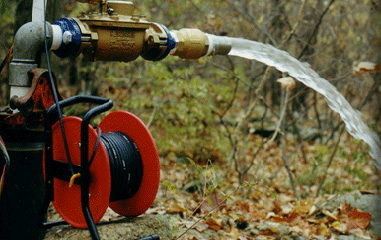 The state of Connecticut has established a code which dictates that the minimum yield of a water well is required in Gallons per Minute as it relates to the well's depth and diameter. The decision to exceed the state's minimum requirements can be made by the owner or authorized agent, based upon the specific water demands of the house or building. The well driller will be aware of th well's water production throughout the drilling process, and will notify the owner of the yield achieved, as well as when code has been met. Once code stipulations are met, the decision to stop drilling, or to continue on in order to create more storage or possibly achieve more water yield, can be made. 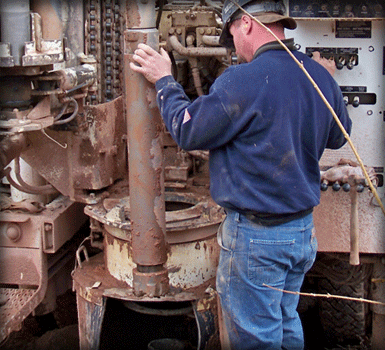 Wragg Well Drilling & Pump Service LLC has the experience and resources to handle your drilling needs. Whether you need a 6” residential well, an 8-10” production well, or if you're not quite sure what you need, our professional staff will be happy to assist you. When contracting Wragg Well Drilling & Pump Service, LLC, to drill your well, a representative will first conduct a site visit in order to determine ideal well locations. After a location has been engineered, Wragg Well Drilling & Pump Service will draft and submit a well drilling permit to your local health department. Once the permit is approved, and a date scheduled to begin work, the drilling rig will set up over the selected well location. Deepening an existing well is one possible solution to an issue with low water yield. In addition to possibly achieving more water yield, deepening a well creates additional storage space for water. The average well will hold an additional 1.5 gallons of water per linear foot of well. Water tables rise and fall, and shallow wells are subject to the effects of these fluctuations. Deepening a well can create a buffer of water to reduce the effects of this groundwater phenomenon.